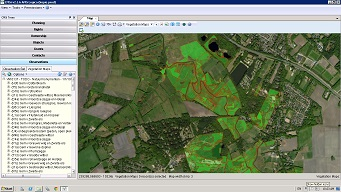 The observations and vegetation mapping module for CMSi was developed to allow managers to integrate wildlife records and vegetation surveys with their site data. Support is provided for entering data as CMSi monitoring projects associated with a site and for incidental records collected by volunteers. The module features a range of input forms that can be customised to suit a variety of recording needs. Data can be browsed from an intuitive tree interface, filtered, and viewed in the standard map window alongside other CMSi layers. The system includes a mobile app (iOS, Android and Windows) and an API to communicate with the backend CMSi system. The mobile app is used by field surveyors throughout the GBNL consortium on iPads and a range of Android tablets. The surveyors record observations and sync these with the backend CMSi database. They typically deal with many thousands of observations and species dictionaries and data volumes are quite large. The mobile app is map-centric and uses the device GPS and offline mapping for the entire country. The app also provides more advanced control over the map layers and allows additional KML and ESRI shape files to be imported and overlaid by the end user.